You are here: Home / Such a clever, beautifully crafted book! 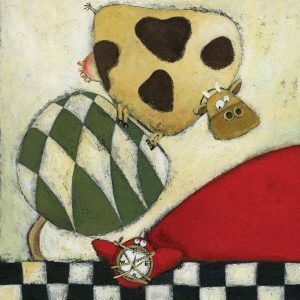 When an eclectic collection of animals come across an egg, they swiftly also find themselves cast in the role of parents. What they lack in bird-ness, they make up for with love and dedication. As Bird grows, he benefits from the diverse breadth of experience that the different animals bring to their parenting. Play might be swinging from the curve of the snake or cradled in the tusks of an elephant. Bird is multi-lingual – he can say ‘Moo’ and ‘Baa’. The one thing the animals can’t teach him, try as they might, is how to fly… It takes the arrival of a new friend to put an end to all the animals’ worrying, and a delightful post-script of an illustration just inside the back cover takes the story onto the next chapter in Bird’s life. 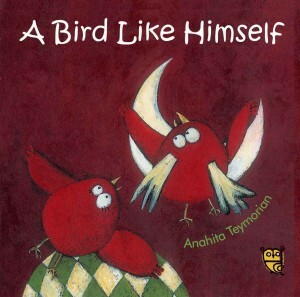 A Bird Like Himself is one of those picture books that offers something special to young children and adults alike. Children will appreciate the nurturing and all the (often absurd) things that Bird learns, without necessarily tuning in to the anxiety of the ‘parents’. 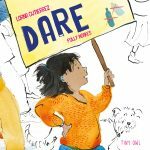 We adults, on the other hand, can ruefully appreciate that anxiety and recognise the way that, in contrast to our getting in a stew over trying to make something happen, children may be unflappable (ha!) in the way they learn to do it, simply because that is the right moment. And, of course, at the back of our minds is the notion of just how quickly children seem to grow up and ‘fly the nest’. 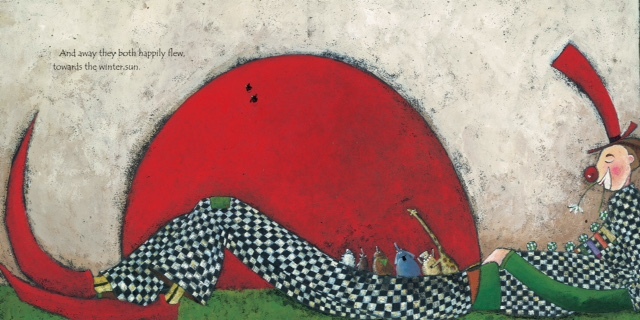 I don’t know whether this idiom exists in the original Iranian of the story, though the notion is certainly universal; it is certainly a happy coincidence for an English-speaking audience. So on one level, this is quite a profound story – but don’t be misled: this is a very funny book. It delights in the absurd and will appeal hugely to young children. 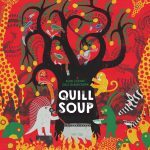 The illustrations are as integral to the narrative as the actual words (and the muted, somewhat restricted palette works beautifully|). Translator Azita Rassi deserves a special mention. The earnest matter-of-factness of the text is so belied by the pictures that I for one was chuckling aloud all the way through. Even the egg hatching at the beginning is accompanied by a tiny ambulance zooming away. 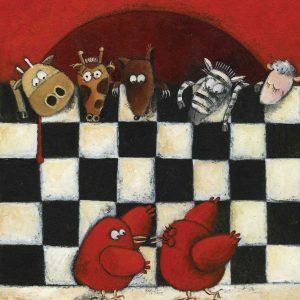 The animals really do try very, very hard – and we can see in the illustrations how over-complicated their attempts at explaining and demonstrating become (how many times do we, as parents fall into that trap?!?). Just look at this one with the cow perched in the tree – will she so far forget herself as to launch herself into flight? – and Bird, with a compass strapped hopefully to his back! 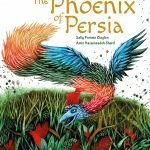 And then at the very end, Anita Teymorian turns the whole landscape of the story (both visual and metaphorical) on its head, so that the absurdity of this particular collection of animals being together makes sense, though, paradoxically, still in an absurd way. Such a clever, beautifully crafted book! 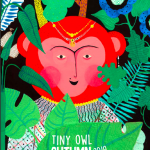 Its creator, Anahita Teymorian has won prestigious international awards and she is very well-known in her native Iran; now, thanks to Tiny Owl Publishing, her work is becoming better known here in the UK too. 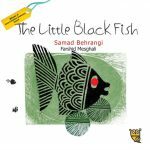 Read MWD’s interview with Delaram Ghaninifard, co-founder of Tiny Owl Publishing: a gallery of illustrations includes examples of Anahita Teymorian’s work.